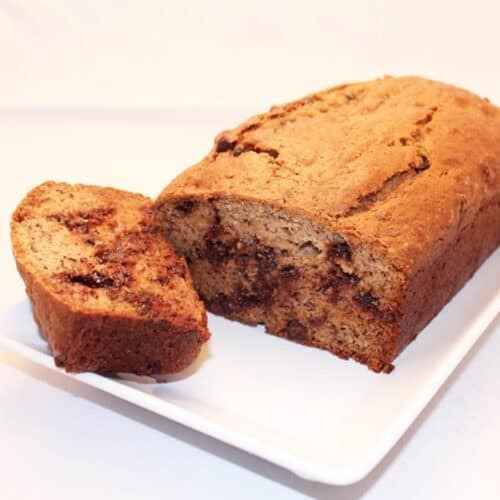 Moist, rich & full of chocolate chips, our Peanut Butter Banana Bread is bound to be everyone's favorite. Great for breakfast or that afternoon snack. Preheat oven to 350 degrees. Grease and flour loaf pan. Crumb sugar, peanut butter and shortening together. Mix in vegetable oil, eggs and milk. Add in mashed bananas. Combine flour, baking soda and salt. Mix into banana-egg mixture. Stir in chocolate chips then pour into prepared loaf pan and bake for 1 hour. Check after 30 minutes to make sure top is not getting overly brown. If so, cover top loosely with aluminum foil. Test for doneness by inserting pick in center of bread. It is done if pick comes out clean. Remove from oven, set on wire rack, and cool for 15 minutes. Remove loaf from pan and finish cooling on rack. This banana bread freezes very well. Allow to cool then wrap in aluminum foil and place in resealable plastic bag prior to placing in freezer.